The point of this golf article is not to knock Rickie Fowler but to show just how much better a PGA golfer Justin Thomas is compared to Rickie Fowler. 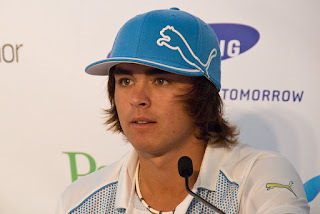 Based upon the way the golfing media treats him, you would think Rickie Fowler has won many PGA Tour events including a few golf majors but Rickie Fowler is anything but a prolific PGA winner and he's never won a major. Why Justin Thomas is a Better PGA Golfer than Rickie Fowler is? So far in his PGA career, Rickie Fowler has played in 179 events and he's won three. That's not a typo all Rickie Fowler has won is three PGA Tour events in 179 starts for a winning percentage of 1.7%. For comparison purposes Jordan Spieth has won 8.3% of the PGA events he's played in and Dustin Johnson has won 6.3% of his tournaments. Which brings us to Justin Thomas. So far in his PGA Tour career, Justin Thomas has won 4 times in 77 events for a winning percentage of 5.2%. So not only has he already won more PGA tournaments than Rickie Fowler has (4 to 3) his winning percentage is three times higher than Rickie Fowler's is. There is also a big age gap between Justin Thomas and Rickie Fowler. Justin Thomas is just 23 years old and he's already won four times on the PGA Tour compared to just three wins for Rickie Fowler who is 28 years old. So Rickie Fowler is five years older than Justin Thomas but has one fewer PGA Tour win. Rickie Fowler has won two other tournaments on the European Tour and one other tournament on the Asian Tour but on the PGA Tour this is no doubt that Justin Thomas is a better golfer than Rickie Fowler is. Due to their age difference, it would be shocking if Justin Thomas does not go on to win many more PGA golf events than Rickie Fowler does.